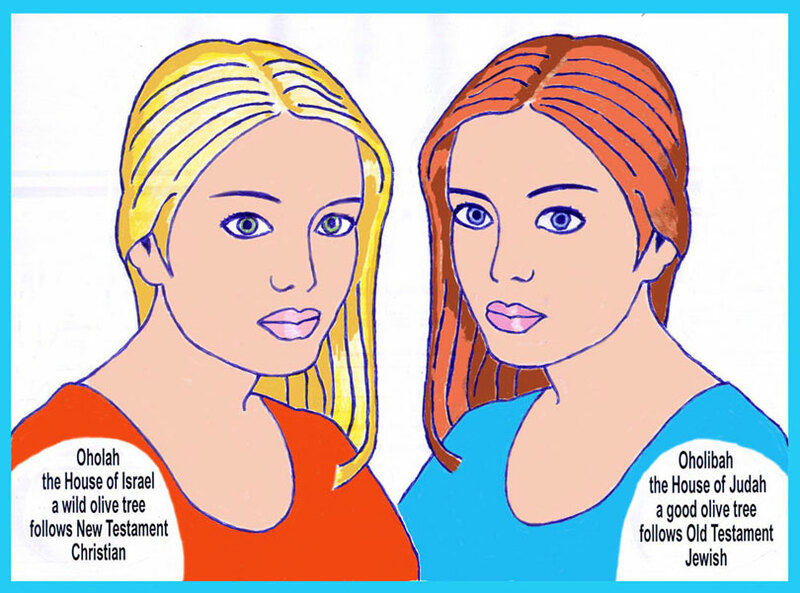 British-Israel.us - Lesson 20 - Who Was Redeemed -- Oholah or Oholibah? Who Was Redeemed -- Oholah or Oholibah? We know God married two women, the Kingdom of JUDAH (Judah & Benjamin) and the Kingdom of ISRAEL (Joseph, Reuben, Issachar, Gad, Asher, Naphtali, Simeon, Levi, Dan, Zebulun). He DIVORCED the Kingdom of ISRAEL (Jer. 3:8; Hos. 2:2) but remained MARRIED to the Kingdom of JUDAH. Then he said to his divorced wife, "Ye shall be REDEEMED without money" (Isa. 52:3). "For thy maker is thine husband ... and the holy one of Israel is thy REDEEMER.... For the Lord hath called thee as a wife FORSAKEN and grieved in spirit, even a wife of youth, when she is CAST OFF, saith thy God. For a small moment have I FORSAKEN thee; but with great mercies will I gather thee. In overflowing wrath I hid my face from thee for a moment; but with everlasting kindness will I have mercy on thee, saith the Lord thy REDEEMER ... But My kindness shall not depart from thee, neither shall my COVENANT of PEACE (New Covenant -- Heb. 8:10) be removed" (Isa. 54:1-10). By this sign we can identify who the lost ten tribes of Israel are today. This passage can't refer to Gentiles since they were never married to God to begin with. China, Japan, Burma, Siam, etcetera, are Buddhists; India is Hindu and Brahmin; Arab countries practice Islam. Africans participate in voodoo and nature worship. Most of South America and Europe is Catholic. Who is left? Just the CHRISTIANS of the United States and the British Empire. These nations call Christ their REDEEMER. In Ezekiel 23, OHOLIBAH -- the JEWS -- didn't need to be REDEEMED or bought back in this sense so she refused to recognize the MESSIAH as part of the JEWISH religion. But OHOLAH -- the Kingdom of ISRAEL -- needed to be bought back or REDEEMED because she was DIVORCED, so Christ died for her and she now has the CHRISTIAN religion and is soon to be REMARRIED to him -- after he died so as not to violate the divorce law (Deut. 24:4). Yes, "For the transgressions of MY PEOPLE was he stricken" (Isa. 53:8). Remember the words of the disciples on the road to Emmaus: "But we hoped that it was he which should REDEEM ISRAEL" (Luke 24:21). Then there is the prophecy of Zecharias: "Blessed be the Lord God of Israel; for he hath visited and REDEEMED HIS PEOPLE ... that we should be saved from our enemies ... and to remember his holy COVENANT; the oath which he sware to our father Abraham" -- multiplicity of seed (Luke 1:68). "More are the children of the DESOLATE than the children of the MARRIED wife ... the reproach of thy widowhood shalt thou remember no more. Therefore the ten-tribed OHOLAH must be a HUGE POPULATION of CHRISTIANS, under the NEW COVENANT, obeying their Jewish husband, whom they call "REDEEMER." Remember that Christ came that he might confirm the promises given to Abraham (Rom. 15:8). Hence the passage: "I will say to them which were not my people (House of Israel -- Lo ammi -- Hos. 1:9), Thou art my people" (Hos. 2:23). Isn't this the very language CHRISTIANS use when describing themselves (Rom. 9:25; 1 Pet. 2:10)? CHRISTIANS are called GOD'S people. But "a hardening in part hath befallen Israel, (OHOLIBAH -- Kingdom of JUDAH) until the fulness of the nations (or "multitude of nations" -- Gen. 48:19 -- OHOLAH -- Kingdom of ISRAEL) be come in, and so all Israel shall be saved (Rom. 11:25). These two women also are symbolized by two olive trees (Romans 11). The good olive tree is JEWS because JUDAH'S name was "A green OLIVE TREE, fair and of goodly fruit" (Jer. 11:16). The wild olive tree was "gentiles" -- Greek ISRAELITES who had not yet been introduced to Christianity--because ISRAEL'S "beauty shall be like the OLIVE TREE" (Hos. 14:6) also. Thereby we know the identity of the two witnesses of Revelation 11:4 since they are symbolized as TWO OLIVE TREES also. JUDAH and ISRAEL both "shine as lights in the world" (Phil. 2:15; Matt. 5:14) because one uses the Old Testament and the other uses the New Testament. "Thy WORD (Old and New Testament) is a LAMP (menorah) unto my feet, and a light unto my path" (Ps. 119:105). Yes, Isaiah 43:10 says of Jacob (both houses of JUDAH and ISRAEL), "Ye are my WITNESSES saith God." Isaiah 44:8 says, "Ye are even my WITNESSES" (both houses -- JUDAH and ISRAEL). "JUDAH was his sanctuary and ISRAEL his dominion" (Ps. 114:1-2) -- Oholah and Oholibah. Jesus' parables of the "two sons" (Matt. 21:28-32; Luke 15:11-32) is again referring to these two women -- JUDAH and ISRAEL. OHOLAH is the son who "was dead, and is alive again; he was lost, and is found" (Luke 15:24) by means of CHRISTIANITY. OHOLIBAH was never lost. She is the son who said, "these many years do I serve thee, neither transgressed I at any time thy commandment" (Luke 15:29) by means of JUDAISM. Her reward will be all of God's inheritance (Luke 15:31). However, later Jesus said, "The kingdom of God shall be taken from you (OHOLIBAH'S chief priests and Shammai Pharisees who follow the Talmud in preference to Scripture -- Matt. 21:45), and given to a nation (OHOLAH -- Kingdom of Israel) bringing forth the fruits of it" (Matt. 21:43). Why? Because OHOLIBAH'S chief priests and Shammai Pharisees crucified Jesus and persecuted Christians while OHOLAH accepted him. But what about gentiles? OHOLAH was cast out and became gentilized. In the process of REDEEMING OHOLAH, Christ opened the way for any non-hereditary Israelite to also be saved -- first by accepting CHRIST'S sacrifice in payment for their sins like a lost ISRAELITE; then by obeying the Bible like a JEW. Israelites are just the "firstfruits" of a harvest (Jer. 2:3). Not the entire crop.